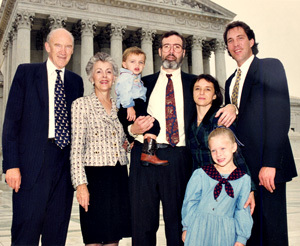 The Simpson family has served Wyoming throughout the 20th century. William “Billy” Simpson (1868-1940) was a leading attorney in Cody. His son, Milward (1897-1993), served Wyoming as governor and United States senator. Milward’s sons have also been deeply involved in Wyoming and national politics. Alan served in the Wyoming State Legislature and the U.S. Senate. Most recently he was a member of the Iraq Study Group. Peter was also a Wyoming legislator and later became a vice president for institutional advancement at the University of Wyoming. Colin Simpson, the third generation of his family in Wyoming politics, is a member of the Wyoming House of Representatives.